Chimes are made from recycled metal and carefully handcrafted by artisans in India.Hang on an outdoor porch or in any indoor room. 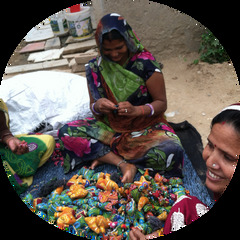 Measures 3.5 by 5 inches excluding rope..
Mira Fair Trade strives to promote social justice by working directly with underprivileged artisans by paying them fair wages to help them develop the knowledge to support themselves and their families. They are committed to empowering women and underprivileged communities, and moving towards a global Fair Trade lifestyle through the promotion of the Fair Trade Principles.